A perennial, rough-pubescent or nearly smooth, erect plant, 1 to 3 feet tall, not provided with stinging hairs as are the true nettles. Leaves mostly opposite, thin, petioled, ovate to ovate-lanceolate, coarsely toothed, 1 to 4 inches long, one-half to 1 ½ inches wide. Flowers greenish, small and dioecious, that is, some of the axillary spikes containing only staminate flowers, and others only pistillate flowers, or some of the spikes containing both kinds of flowers (androgynous); the staminate spikes interrupted, the pistillate mostly continuous, one-fourth to 1½ inches long, often terminated by small leaves. In moist soil and thickets, Quebec and Ontario to Minnesota, Florida, Texas and the West Indies. Flowering from July to September. Not an attractive plant but figured here as a representative of the Nettle family, none of our species having conspicuous flowers. 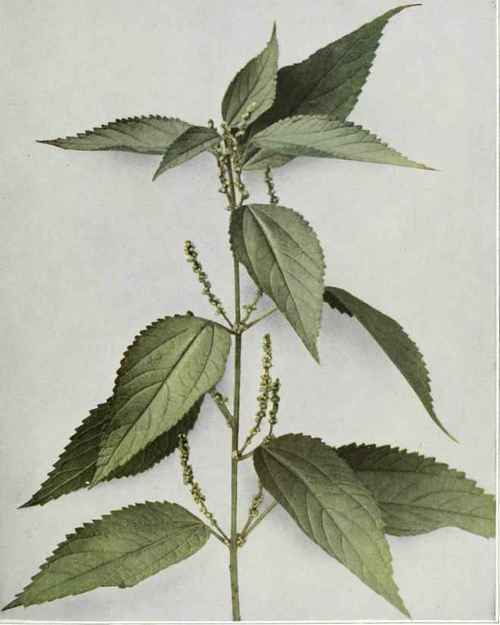 The True or Stinging Nettle (Urtica dioica Linnaeus), naturalized in the eastern states from Europe, the Slender Wild Nettle (Urtica gracilis Aiton) and the Wood Nettle (Urticastrum divaricatum (Linnaeus) Kuntze) are all provided with stinging hairs and are most unpleasant plants to encounter unexpectedly in the woods.